One thing I really enjoy is when players get their avatars really nice for the purpose of playing. Obviously a lot of people aren’t as dedicated to it as others, but I thought I would share periodically some nice finds from the Marketplace that you might like to peruse if you are playing (or thinking of playing) that sort of character. This article is for female ghost players primarily, but some of it might be useful to any ghostly player. This little gem is a Fuubutsu-Dou product by Nya Alchemi, includes most of what you see here. 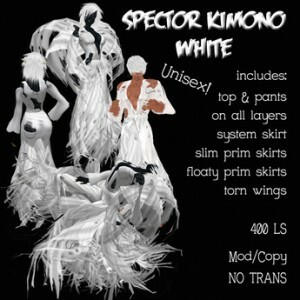 The skin, shape, kimono, much of which is scripted for easy resizing. There are even attachments for the legs to give the appearance of floating. The only thing really not included is the hair. which is okay, you might want to add your own customization there anyway. But more or less, its a full avatar right off. At a very affordable 250L, that’s not bad at all. You might have most of an avatar, but need a kimono with a little ‘flare’. This one, by Lumina Elvehjem, is quite haunting, although perhaps a little pricey, at 400L. A very nice, scary look. This one could work for a man or woman really though. 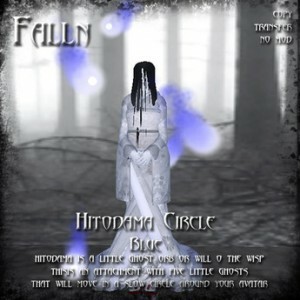 If you are looking for a nice japanese haunted effect, check out this Hitodama Circle by FallnAngel Creations. There are many different variations, so there’s a lot to choose from, but its a very good effect for a japanese ghost entity, particularly one that might be fairly powerful, or at least want to appear that way. Maybe you don’t want to be a human ghost? or want to appear a little more inconspicuous before scaring the pants off a visitor? This might be a good pick of an avatar option for you then. 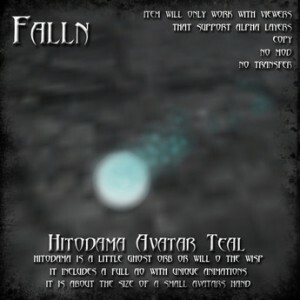 Also by FallnCreations. This isn’t particularly Japanese, but it is fricken creepy as hell. There is a male counterpart of the groom to this, and I think its generic enough and its MODable, so you can futz around a bit to make it work with the genre. Its worth a look, being as deliciously creepy as it is. 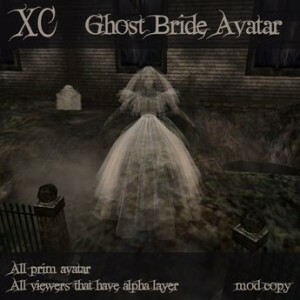 This avatar is by xCaleyx Westland and is temporarily on sale for 99L. Can’t beat that price!